Pasta, the Italian product par excellence, evokes the image of family, tradition, a well-known flavour, but which always surprises, something that is good for its taste and genuine for health. So, a big task is up to the producers of pasta: creating a food which, by simply savouring it, may be able to let these memories and feelings relive. 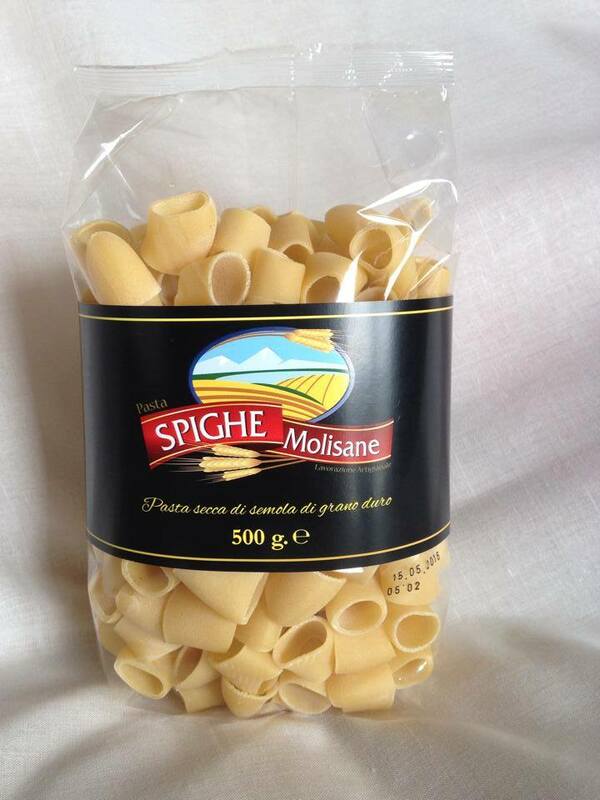 The pasta factory ‘Pastificio Spighe Molisane', thanks to a completely artisan manufacturing process, realized this goal. It was born thanks to Michele Petraglione and Vincenza Miele’s action. They decided to create a unique craft product, characterized by the highest quality. Their four daughters, Lina, Patrizia, Katia, and Maria welcomed the project designed by their parents and undertook the road which led to create a work of art: the ‘Spighe Molisane’ pasta. The pasta factory, managed by Lina Petraglione, produces about 50 quintals of pasta a day, with a process which requires specific standards: an average temperature of 45°, a gradual drying stage - in special drying chambers, where pasta is stretched on special looms - which lasts at least 2-3 days, in order to preserve starch in the product, an essential element for protecting our intestine. Lina Petraglione tells about ‘her’ pasta starting «from the beginning, where the quality of our pasta is designed: wheat. It is the undisputed star of the quality of our products. 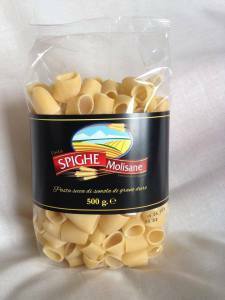 The wheat we use is of Italian origin, and, for some typical products, it comes exclusively from Molise». One of the strengths of the wheat from Molise is certainly the land in which it grows: «The clear and fresh air of our mountains, linked to the ancient scent of a still uncontaminated land, gives wheat and, therefore, to the finished product, the unmistakable flavour of homemade pasta, as the one prepared in the past». The water comes from the cool mountains of this land. It is clear and crystalline. The eggs come from not invasive chicken-farming, where the hens are raised on the ground and grow in the fields, in the open air. This allows producing natural eggs, markedly different from the ones which come from battery cages. «Raw materials, therefore, are the protagonists of our pasta. They are selected with scrupulous care, from their origin to their storage in our warehouse». Lina believes that the land in which the company operates, too, is a very important element for the production: «Cercemaggiore is a small country, located at an altitude of one thousand metres. It is rich in history, here time slows down and, in the early morning, at the highest point, it is possible to enjoy the view of the sea, which is one hundred kilometres far from here». Durum wheat semolina, extracted from the heart of wheat grain, presents itself in all its splendour, with its golden-yellow colour. It is expertly kneaded by skilled makers of pasta, who control step by step the manufacturing stage. Anything else is added to the mixture: neither preservatives nor the like. Its characteristic colour derives from the brightness of the sun absorbed by wheat and is given to semolina. 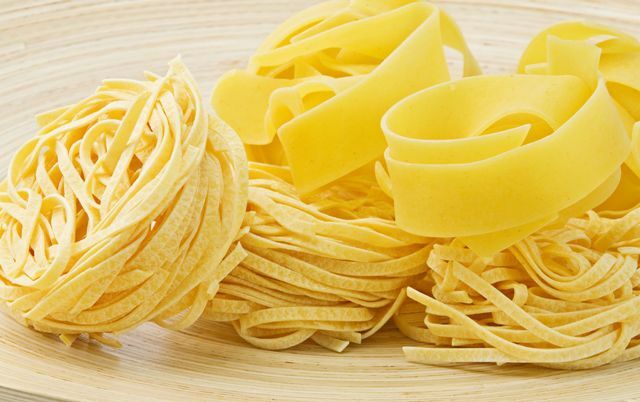 The fresh product is produced and instantly packaged in a sterile environment, while the dry product is dried at very low temperatures and for long periods of time, so that pasta keeps unchanged all its organoleptic and nutritional properties. 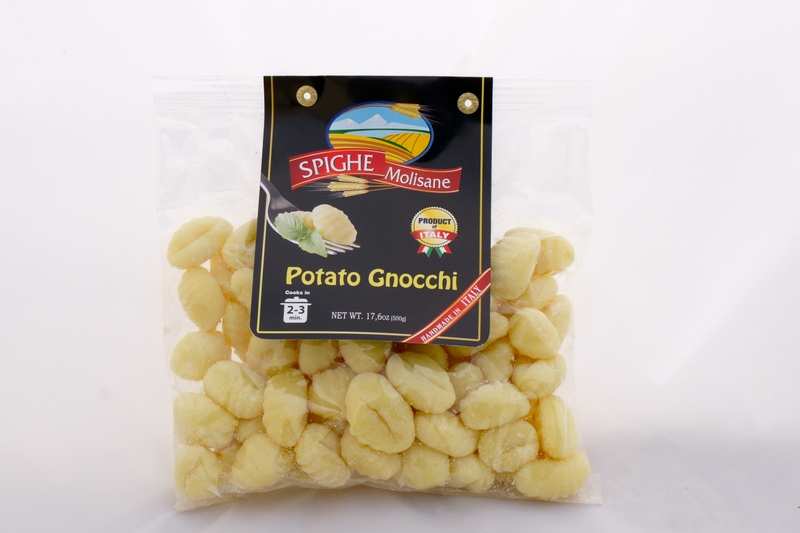 Lina wishes to specify: «The constant attention we devote every day to our products guarantees that in ‘Spighe Molisane’ an always healthy and good pasta, according to tradition, is found». A production of fresh pasta is proposed, in both bronze drawn and with egg lines, too, as well as dried pasta, both categories also in organic version: ‘Cavatelli’, ‘Cercesi’, ‘Fusilli spaccati’, ‘Taccozze’, ‘Pantacce’, ‘Tagliatelle’. 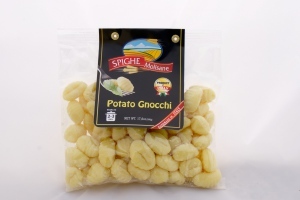 In particular, dry pasta: ‘Maccheroni al farro’, ‘Strozzapreti’, ‘Orecchiette’, ‘Trofie’, which need many minutes of cooking, is synonymous with high quality, which guarantees that the product has been properly dried, in a very slow and almost natural way. 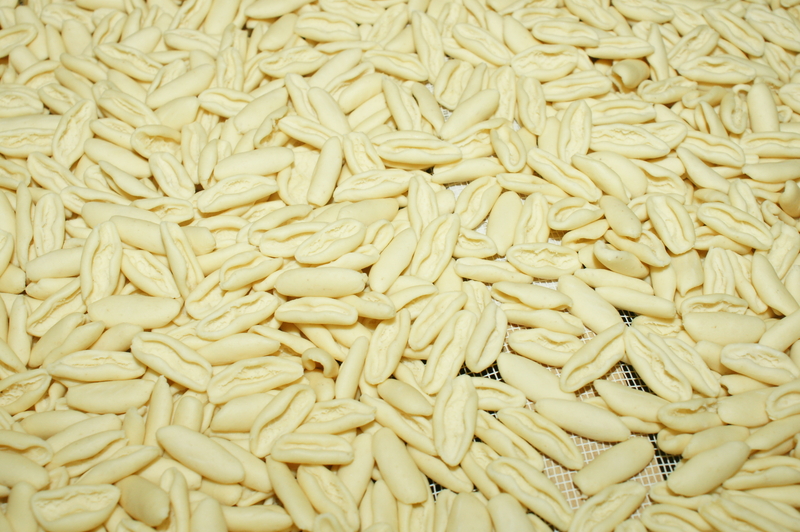 The drying process does not affect in any way its properties, and pasta is not attacked, on the contrary. In this moment, two stages alternate: one which refers to the strict sense of the term ‘drying’ and a ‘rest’ one, which allows pasta to stabilize and prepare for a new drying stage. All these qualities are found in the flavour of these products, which is immediately perceived by careful consumers, at first tasting. The production by Spighe Molisane, devoted to craftsmanship, is noticed in its packaging, too: it has been kept as much manual as possible, just in order to further emphasize the meticulous attention paid to every single package. The innovative package of g 150 pasta, designed for singles, or in any case as a ‘monoportion’, met wide success. Lina explains: «With this package we reach the height of elegance thanks to its transparent pack, whose label is characterized by a black background, in which ‘Spighe Molisane’ wears evening dress. The result is a packaging realized with selected food plastics, which allows seeing the product as it is, in all its splendour. The package has neither shades nor opacity which can reduce the visual impact of the product; these packs are «naturally transparent, to avoid distorting the exceptional colour of the product, a very strong yellow- gold, a colour we want to preserve with care and concern». The weight of the packs is determined by hand, and this passage allows checking pasta in each package, grain by grain. Therefore, utmost attention is paid to every detail, so that «the finished pack can be perfect. Our consumers must perceive the quality of our product, verify its perfection, or at least something very close to it». Therefore, the label is applied by hand, by means of hot glue. This is a ritual which is synonymous with excellence, and from which the consumer can understand the work behind each package.